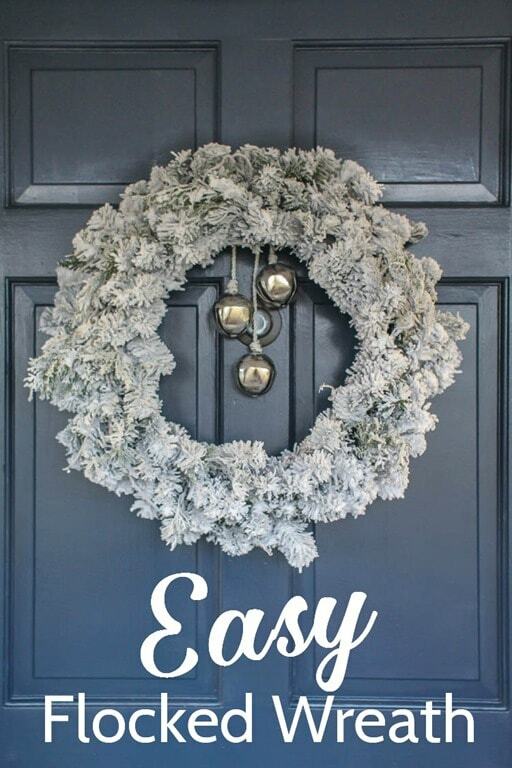 Easy DIY Flocked Wreath - Lovely Etc. I seem to be a bit obsessed with flocking at Christmas. A couple of years ago I flocked our artificial Christmas tree and I am still completely in love with it. This year I decided to try something new and flock a wreath. I wasn’t completely sure how it would turn out, but it’s even more beautiful than my tree! I can’t wait to show how easy it was! Also it is with much excitement that I join this year’s Home for the Holidays blog tour sponsored by Sondra Lyn at Home! This is the 3rd year for her HFTH tour, and we promise to bring some of the most awesome decor, craft and recipe ideas you’ll find anywhere. It has gotten bigger and better each year and I think you’re going to love what you see! So stay tuned – it’s 30 blogs over the week, with a different topic each day. But first, here’s how to make that gorgeous wreath. I started with a very basic wreath. It wasn’t particularly attractive but the flocking made a huge difference. Flocking something is actually very easy. Be sure to put some type of dropcloth beneath your work area before you begin. 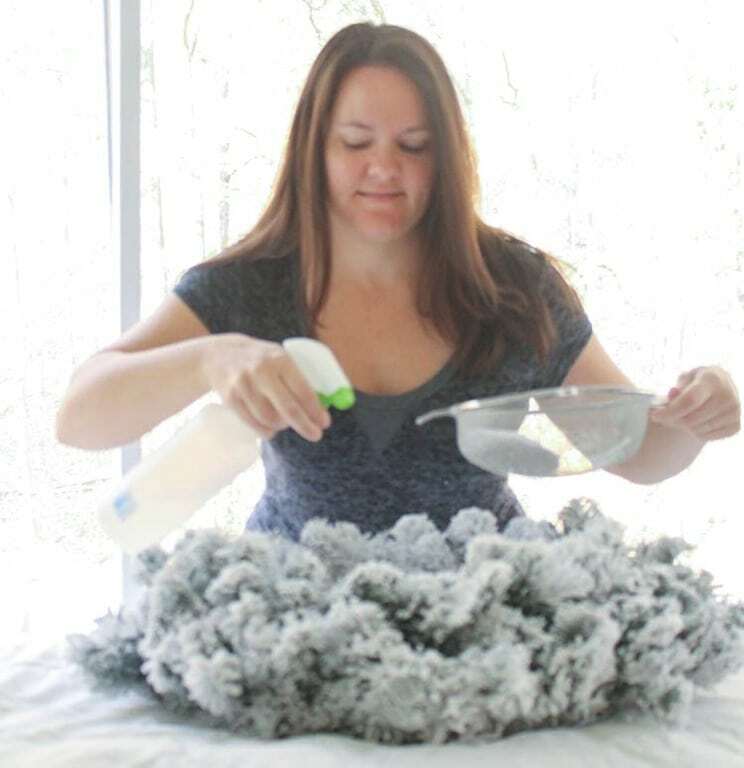 Then simply spray water on the wreath and sift flocking powder onto it. Give a few more mists of water to help set everything and let it dry for a few hours. It’s that quick and easy. Without adding a single other thing, it already looked a million times better. But since I used a very basic wreath, I wanted to make it a little more interesting. You could easily buy some pretty Christmas picks to add, but I decided to go the free route. 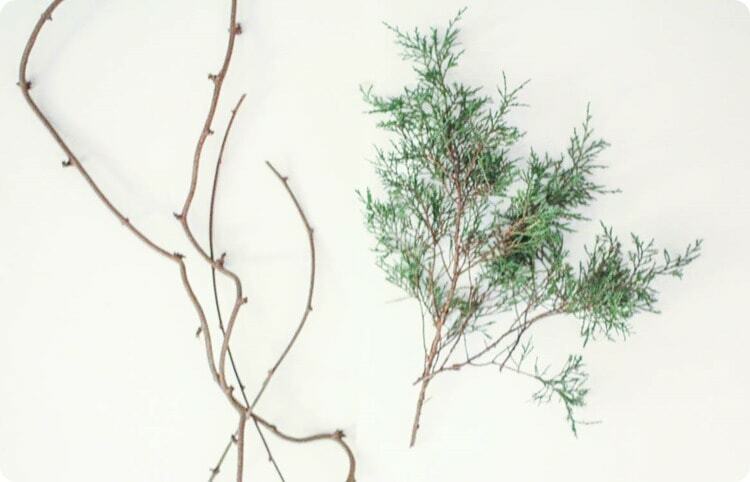 I simply took my garden shears outside and cut some bits of vine and cuttings from some evergreen shrubs. My husband laughed when I told him I used greenery and branches from the yard. But wasn’t all Christmas greenery originally cut fresh from outdoors? There’s no reason not to use what’s in your yard, even if all you have is a few broken branches! I flocked the vines and branches in the exact same way as the wreath. Then I simply stuck them in the wreath to give it texture. Because I flocked them separately, it will be easy to remove them later if they wilt as they dry. I’ve had people ask about using spray snow or something similar instead of flocking. I’ve seen others make their own concoctions using glue and glitter. And you could certainly use either of these methods. But I can guarantee nothing is as beautiful as real flocking. It does cost a bit more, but I have used the same 5 lb box of flocking to flock my tree twice, flock this wreath, and flock quite a few branches and clippings and still have plenty left in the box so it goes a long way. If you only want a small amount for a few small projects, you can also buy a 2 lb. box much cheaper. The wreath looks beautiful on my front door. But I decided to hang it inside in my entry instead. I framed it with an old wood frame. It was originally part of a mirror with an old dresser but the mirror and the dresser were long gone when I found it at a yard sale this summer. And it was the perfect match with my flocked wreath. 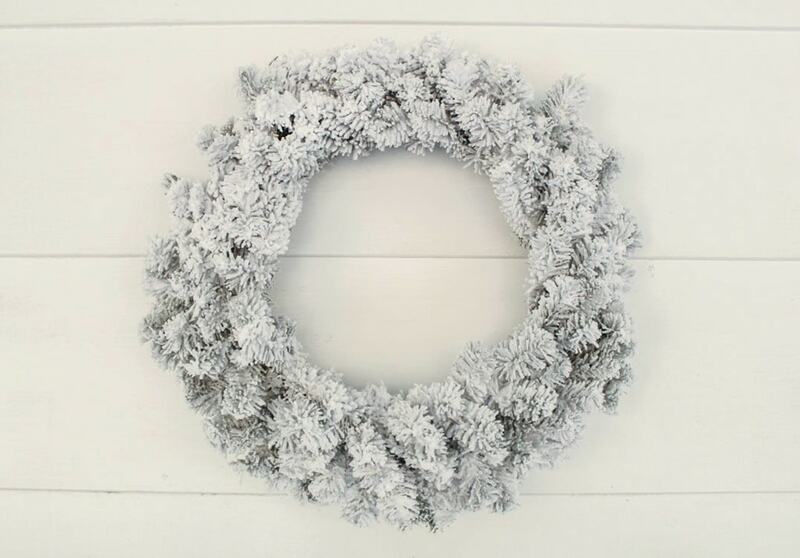 I love that this wreath is beautiful for Christmas but will also work perfectly the rest of the winter. This year I used lots of repurposed and nontraditional colors in my Christmas decorating and I love it! You can see the rest of my home decked out for Christmas here. Carrie…I have never flocked anything before and after this post, I want to do it NOW!!! My mind is spinning with all the things I could flock. I am so impressed with the wreath you flocked, how beautiful. Thanks for giving me something to put on my ‘crafts i must do’ list. Thank you Lynn! I have definitely become addicted to flocking – now I want to flock everything! For years I had a flocked tree in my dining room. It came that way and I never knew the flocking process and how easy it is. I need to get some flocking powder and try my hand at flocking. Your wreath is beautiful and I love that it can hang out all winter long. Thank you Alli! It really is super easy and flocking is so beautiful! Beautiful! I wondered how people flocked their Christmas tree and now I know it’s with flocking powder. I had no idea such a product existed! 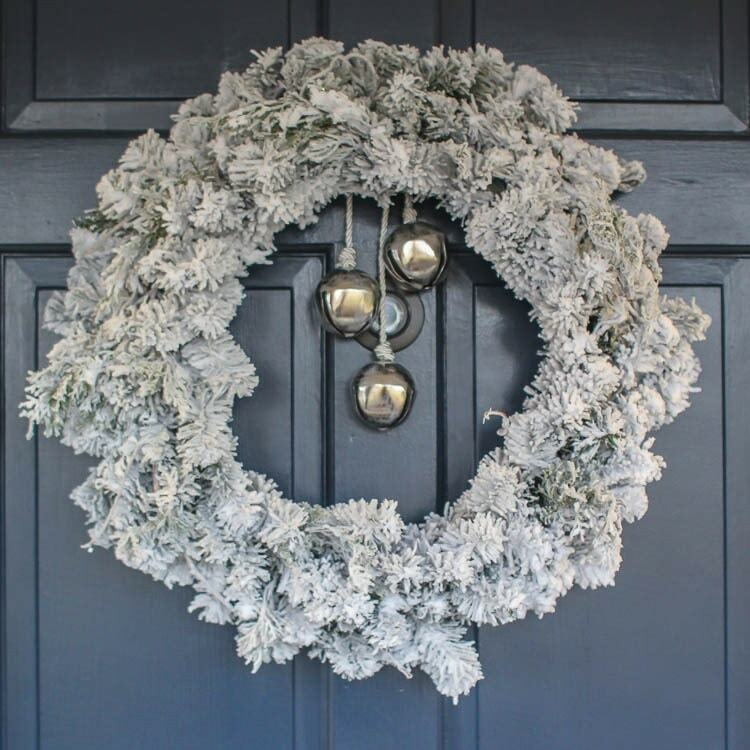 Flocking really fluffed up your wreath and with the addition of a few things from your garden, it looks fabulous! Thanks Paula! It really is so easy to add flocking and it makes such a huge difference! This is so beautiful! I love the mix of texture with the real branches. I’ve always wanted to try flocking but have worried it would “shed”. Have you ever had that issue with this product? Thanks for sharing! Thank you Lydia! I have had some shedding of my flocking, mostly when I am fiddling with the wreath or tree or whatever I flocked. But it is easily swept up and the majority of the flocking sticks well. I love it so much that for me, a little extra dusting is worth it! So gorgeous! I never knew what real flocking was. I have tried the spray snow, but that didn’t work very well. This is great to know! I bought a flocked tree last year… I’m going to have to try this on a wreath!! It’s wonderful to have you on the Home for the Holidays tour! Merry Christmas! Thank you so much Sondra and thanks for inviting me to the tour! I absolutely love flocked trees and now I just want to flock everything! How did I not know about flocking powder????? I used can snow but I know you can’t use very much of that on trees with lights. Thanks for the great info. Thanks Deborah! Flocking powder is great stuff! Carrie, I’ve never flocked anything but now I want to try it. I also have to give a shout out to that adorable little spindle tree!!!! I’ve made a different spindle tree for the last three years. This weekend I’m making this year’s spindle tree. Great to be on the tour with you. Hugs. Thank you so much Jeanette! 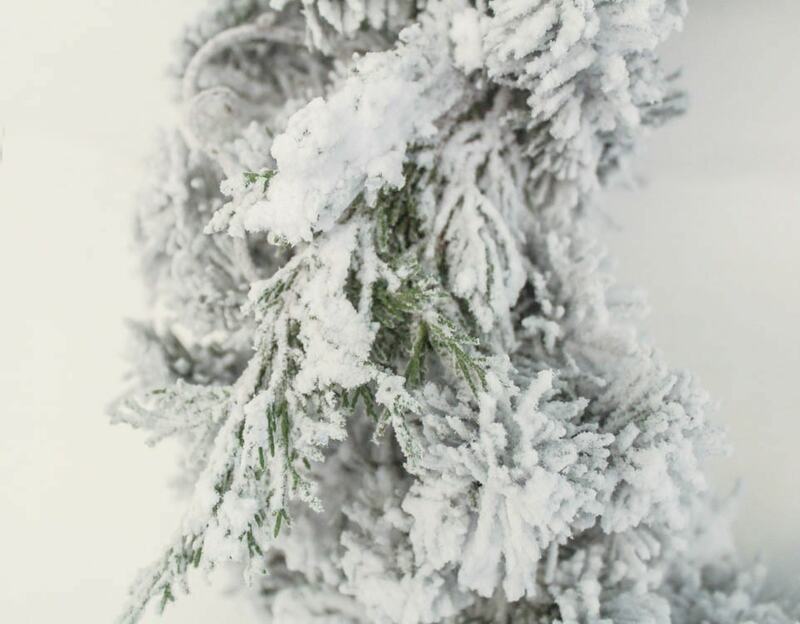 Your trees sound so fun – looking forward to seeing this year’s! Absolutely gorgeous!!! I NEED to try this! Thank you Maryann! It is so fun! Love this. I have been dying to try flocking. I want to do it on my sun porch try but wimped out this year. Maybe I will try it out on a smaller scale project like a wreath. You should definitely try it Michelle! 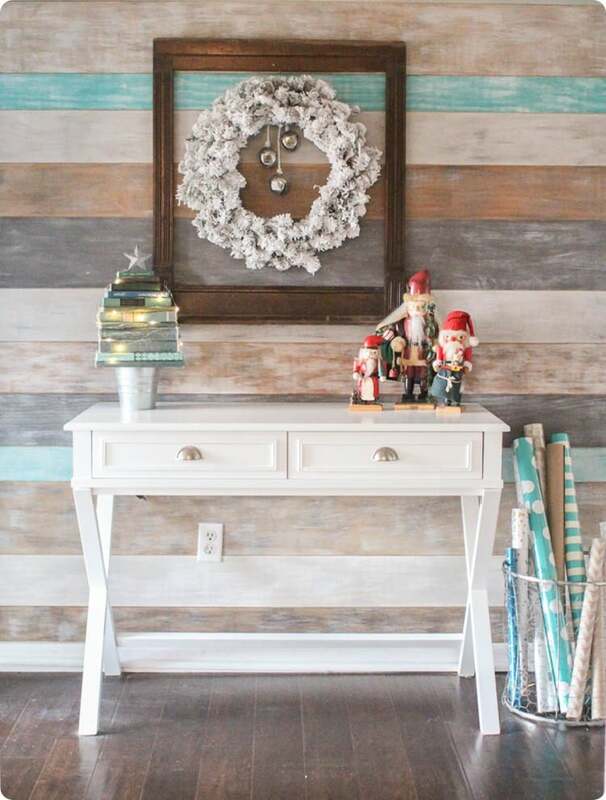 I LOVE how you framed your pretty flocked wreath with a frame. So stunning against your beautiful wall. It’s beautiful! I love the flocked look but I haven’t tried it yet. 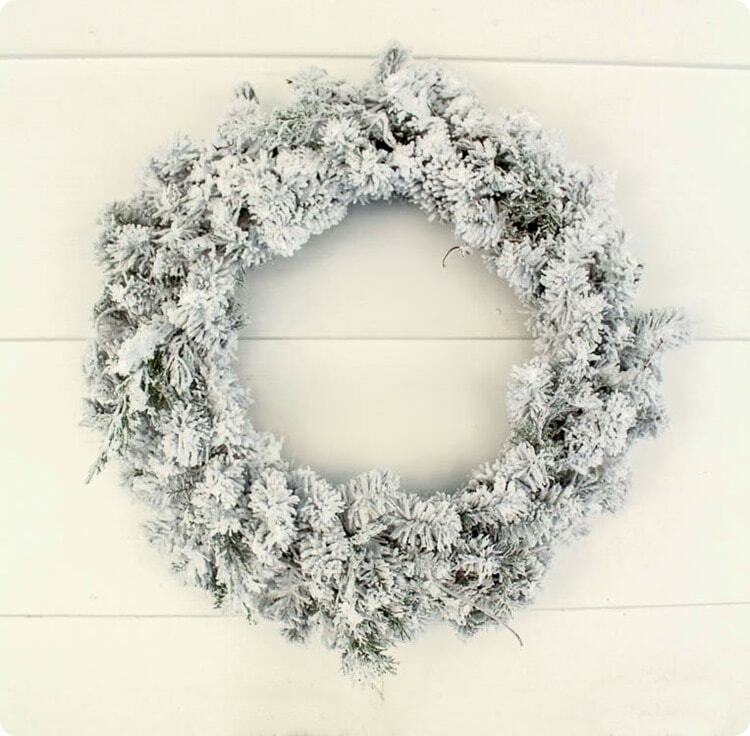 I also love that this wreath can be kept out all through Winter. Thanks Lenane – I love that it works all winter too. Makes things lest lonely when all the other christmas decor comes down. Seriously? I had no idea it was that easy!! Pinned! I know right – so simple! Love this idea! Where do you buy a 5 lb. box of flocking powder?? I actually looked for it at the craft store and the sales clerk handed me a 2 oz. bottle! I laughed at her, it would never be enough to do anything with! Love your home, this project is on my to do list! Yes, I haven’t found any in stores but you can buy it on Amazon – there is a link in the post! 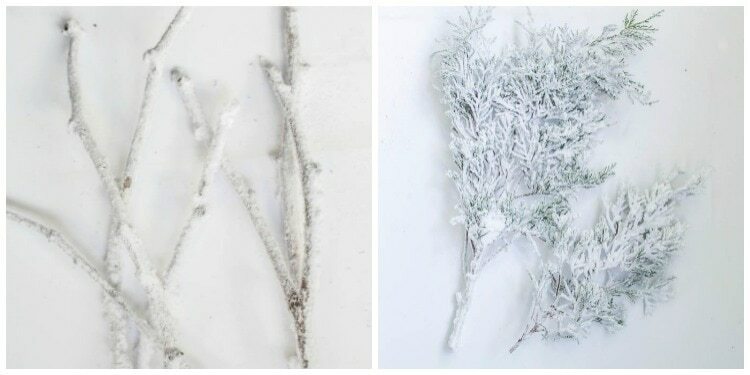 Carrie, what a great alternative to a ready made flocked tree or wreath. Thanks for sharing . i have always been curious on how people do it themselves. happy holidays! Thanks Laura! Doing your own flocking is so easy and it is even better because you can flock pretty much anything. 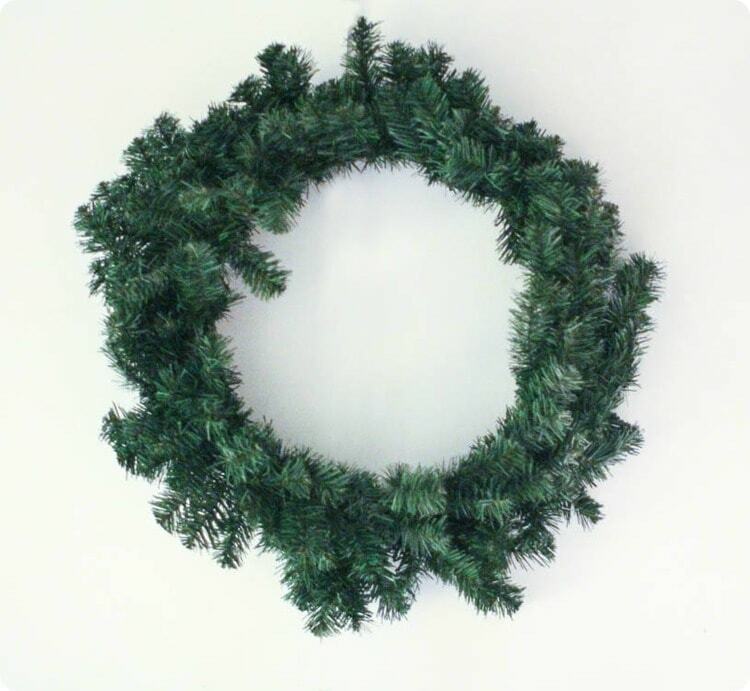 Your wreath looks incredible! I’ve never flocked anything before, but after seeing how easy it is, I need to try it! Thank you Angie – it really is super easy!